"It feels like yesterday for her when Sir Henry Cecil died. She says it gets harder not easier." So said George Scott, the bright-eyed assistant to the 10-time trainer's widow Lady Cecil after a stirring triumph that would lift the hardest of souls. Noble Mission's victory for her in the Champion Stakes at Ascot was a proper sporting fairytale. Sir Henry was a racing icon, his death in the summer of 2013 shaking those who loved him through numerous highs and lows and the swansong which was his handling of the unbeaten wonder horse Frankel. His beloved third wife Jane, who had helped nurse him through years of cancer, nervously took over the training licence, to some scepticism from those who felt she might not be up to the task. But there were shades of the great man as she emotionally watched Noble Mission, a younger brother of Frankel, win in testing ground after a ding-dong duel up the home straight before edging out the admirable Al Kazeem by a neck. Two years on from Frankel's victory in the same race, his 14th win from 14 starts, the green, white and pink silks of owner Prince Khalid Abdullah were first past the post again, by a neck. 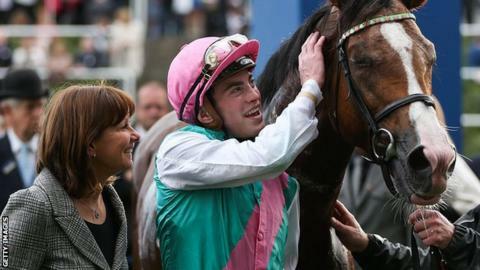 Lady Cecil - known simply as Jane by her friends - was shaking a little as victory, following a front-running ride from jockey James Doyle, sank in. "I knew that if he won it would be a fairytale and it absolutely was," said the 57-year-old. "We knew the horse was in the form of his life, but we hardly dared to dream it could happen. It's a tough race and he absolutely toughed it out. "This is so special because of what happened two years ago - I keep thinking I'm in a dream and will wake up. It has come true hasn't it? "I had my head in my hands [in the closing stages] because I didn't think he would hang on, but he's so brave." She recruited Scott, 26, as assistant after the departure of Sir Henry's right-hand man Mike Marshall. "I was assistant to Simon Callaghan in the United States and I got a call from Jane about a year ago," Scott told me. "Henry was the most wonderful trainer, but he did it through feeling, there was no system left behind, so we've had to work out our own system." Noble Mission, winner of the Tattersalls Gold Cup at the Curragh in May, was brought along carefully with this £1.3m contest on Champions Day, Britain's richest raceday, as the end-of-season target. The downpours in early October aided the cause of a horse who prefers softer ground, and after "working unbelievably" in a racecourse gallop at Kempton, the team knew they had a chance. "This was a mighty training performance," said Scott. "I adore Jane so much. She's there every second of the day, out early every morning. It's a team thing like any yard but she makes all the decisions. There is no question about her involvement." The £4m Champions Day concept, as a mid-October flagship for the latter part of the flat racing season, has taken plenty of stick. Withdrawals of some of the season's top performers, and downpours throughout the month leading to heavy going, made for much scepticism in the build-up. But the day shows a modern side to a sometime stuffy sport - free entry for students, Champions Series hashtags on the Ascot lawn and a tweet wall on the grandstand concourse - as it looks to embrace a younger audience. A bubbly crowd of 28,741 was up from 24,290 last year and the second biggest in the event's four years, only topped by a 32,000 sell-out for Frankel's farewell in 2012. "After the build-up we've had this week, it's a terrific outcome," said Champions Series chief Rod Street. "We didn't just get a fairytale, we got a race that was fitting for the occasion. We're thrilled to bits." Al Kazeem, and trainer Roger Charlton, deserve immense credit too. The horse was retired to stud last year after a 2013 which yielded three successes at the top Group One level. But Al Kazeem proved sub-fertile and returned to Charlton's stables. Whatever the plus points of a stallion career, he seems to quite like the old job of racing. Doyle had been on board last year for those triumphs, which helped him secure the plum role as Abdullah's retained rider, and the irony of beating his former partner was not lost on him. "When I saw the head come to challenge me two furlongs out I knew immediately it was my old friend," said the rider, who was given a seven-day ban and £10,000 fine for using his whip above the permitted level in the closing stages. "And although I was delighted to see him come back to his best, I owe him so much in a way, I wish it hadn't been him I was beating." In advance, it had seemed the day would be about Cirrus Des Aigles, the French challenger who won in 2011 and gave Frankel a fright when runner-up two years ago. "It wasn't the day for him but it was a symbolic win and great for racing," said trainer Corine Barande-Barbe after her stable star finished fifth. The famous Cecil family flag, raised after every Group One triumph, was flying again over the Warren Place stables in Newmarket on Saturday night. For Jane Cecil, it won't make up for the missing piece in her personal jigsaw - the man she loved. But my, Sir Henry would have been proud. "Can you imagine when Henry died if we had given everything up? It was easier to keep going at the time and it was a way of staying close to him," she said. On the day when it was announced a feature-length documentary had been commissioned of the Frankel story, it felt more like a full-blown Hollywood movie. Mission accomplished.